Neymar JR and his fiancé, Bruma Marquezine looks runchy and romantic in a photo he posted on his Instagram page. 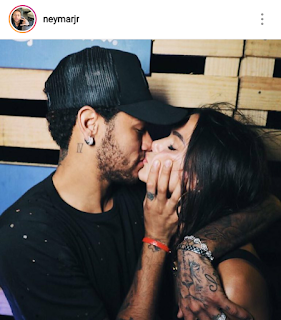 It was a Love-In-Rome affair as Neymar Dos Santos Jr shared photo of himself and his beautiful Fiancé who's a Brazilian Actress, kissing. Such a beautiful sight to see. The photo was taken by a photographer named Raul Aragão. Here's the link to check out the original photo: https://www.instagram.com/p/BdaOZNhjHVx/.